Niall Linehan Construction have just completed constructing a new two storey contemporary house in Rathcormac, County Cork. 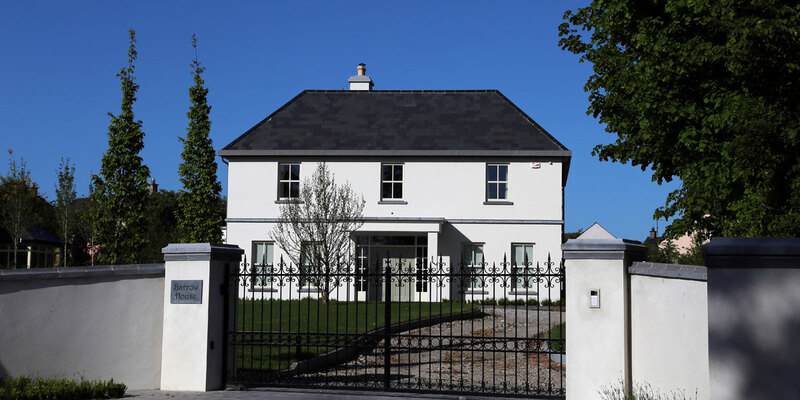 The Rathcormack family home has been constructed using the traditional block construction method with concrete slab floors. Above: Front elevation of property. Left: The light filled main living room. Above: Detail of counter top showing installation around sink and window detail. Right: View from the enterance hall through the kitchen – dining room to the family sun room. Above: Roof light over staircase. Above: Dressing room between master bedroom and en suite bathroom. Right: Double front doors from interior. Left: Curved wall with door to garden from living room. Above: Fireplace with fitted shelves in sun room. Right: View from sunroom through kitchen and dining room. Left: Windows in the study. Above: Roof light and roof detail. Above: Front and side view. The smart home system being installed in the Rathcormack house controls a wide range of features from lighting and heating to security systems and electric gates.